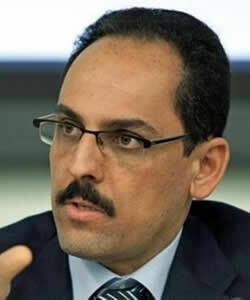 Ibrahim Kalin serves as chief advisor to Turkish Prime Minister Recep Tayyip Erdogan and is a fellow at Georgetown University's Prince Alwaleed bin Talal Center for Muslim-Christian Understanding. Kalin previously taught at the College of the Holy Cross. Kalin founded the SETA Foundation for Political, Economic and Social Research in Ankara, Turkey, serving as director from 2005 to 2009. He is the author of Knowledge in Later Islamic Philosophy: Mulla Sadra on Existence, Intellect, and Intuition (2009), as well as numerous articles and essays. Kalin earned an M.A. from the International Islamic University of Malaysia and a Ph.D. from George Washington University. He was one of the original signatories of "A Common Word Between Us and You," a letter addressed to Christian leaders in an appeal for peace and cooperation between the two religions.